Raymond Wilkinson was born in 1922 in South Shields on Tyneside, the only child of Christopher and Margaret Wilkinson. He worked briefly as a joiner’s apprentice before joining the RAF in 1941. He qualified as an air gunner in the summer of 1942 and was posted to 49 Squadron where he became one of Bill Townsend’s core crew, along with Dennis Powell, Lance Howard and fellow gunner Doug Webb. He flew on more than 20 operations before the crew were transferred to the new 617 Squadron in March 1943. As AJ-O flew low across the Dutch and German countryside on the way to its target, Wilkinson was credited with shooting out some searchlights near Ahlen and he was awarded the DFM for his role on the raid. He was photographed outside Buckingham Palace on the day of the investiture with his crewmates. In July 1943, he flew with Bill Townsend on two of the raids on Italian targets and then in September, he was posted as tour expired. He was sent to a conversion unit for a spell as an instructor, along with his mid-upper gunner colleague Doug Webb. The pair moved on to other training roles but just over a year later, in October 1944, they both came back on operations with 617 Squadron. By then Wilkinson had been commissioned. He joined the crew of the Australian pilot, Flt Lt Arthur Kell, and his first operation of this new tour was an unsuccessful attack on the Tirpitz, moored in a Norwegian fiord, which took place on 28 October. Both 617 and 9 Squadrons were armed with Tallboys and set off from Lossiemouth in Scotland on a trip which took more than 12 hours. In very bad weather, the ship was hit by several bombs but was not sunk. After the war it emerged that it had in fact been badly damaged and was no longer seaworthy, but this was not apparent to the Allies. So a similar force set off from Lossiemouth on 12 November to attack it again and once more Wilkinson was in the Kell crew. They dropped one of the four Tallboys which landed directly on the ship. The combined effect was spectacular, although not confirmed until the following day when reconnaissance showed the Tirpitz capsized, with the bottom of the hull visible above the water. Wilkinson flew on about another 17 operations before the end of the war, including the raids on the U Boat pens at Ijmuiden and the Bielefeld viaduct. He was also present on 617 Squadron’s final wartime operation on 25 April 1945 in a Lancaster piloted by Flt Lt I M Marshall. 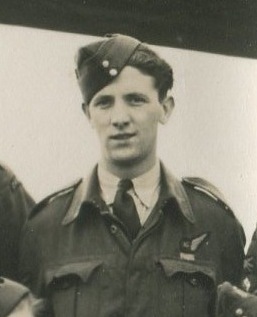 Len Sumpter, another Dams Raid participant, was the bomb aimer in this crew, making Wilkinson and Sumpter the only two people to take part in 617 Squadron’s first and last wartime operations. Ray Wilkinson has an additional unique honour, being the only person to have taken part in both the Dams Raid and the final successful attack on the Tirpitz. Wilkinson married his wife Iris after the war, and they attended the Royal Premiere of The Dam Busters in 1955. They moved to Australia some time later, and he died there on 27 July 1980. Survived war. Died 27 July 1980.